Edelaraudtee Infrastruktuuri, one of the railway infrastructure providers in Estland, ordered a Voice Recording System and a Dispatcher Solution from RideOnTrack. 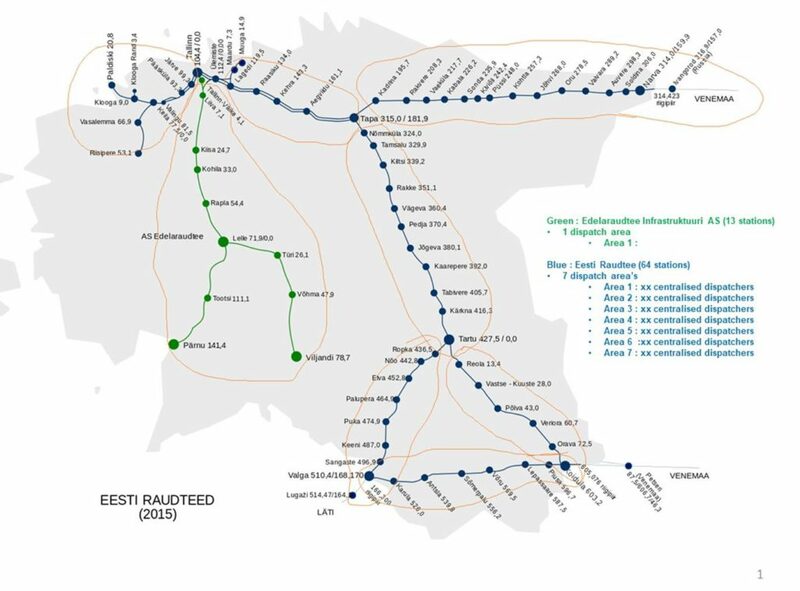 There are 2 independent railway companies in Estonia; Edelaraudtee Infrastruktuuri AS and Eesti Raudtee AS. Both companies are using very similar solutions for their ICT-requirements. In the future both companies will invest in similar solutions as they have equal requirements. Edelaraudtee Infrastruktuuri AS controls one dispatcher area and 13 station. Eesti Raudtee AS owns 7 areas and 64 station and 4 dispatcher locations. (Tallinn-Tapa, Tapa-Narva, Tapa-Tartu-Koidula, Tartu-Valga-Piusa + Tallinn-Keila-Paldiski). Both companies plan to move to all-IP-networks. Edelarautee Infrastruktuuri AS wants to renew the existing analog multi cast dispatching system (APS11N – Russian brand/terminal) during Q1 2018 with the Full-IP-dispatching-system from RideOnTrack. The RideOnTrack dispatcher terminals will be connected via an existing Cisco ASR920 IP/MPLS network. The stations along the track will get 1 dispatcher terminal each. 1 dispatcher terminal will be installed in the Türi dispatching center. From an operational point of view, the dispatcher in the Türi dispatching center will control the group communication over the multi cast network. All communications over the dispatcher system will be recorded by the RideOnTrack Voice Recorder solution. RideOnTrack is very pleased that Edelarautee Infrastruktuuri preferred the RideOnTrack products. This again shows the flexibility of the RideOnTrack Dispatcher Solution. Although the system was originally designed for EIRENE GSM-R dispatching, in this project the customer is not using GSM-R but is using analogue radio and DMR-radio. Edelarautee Infrastruktuuri AS and Eesti Raudtee AS are planning to further upgrade their operational communication systems in the near future and we hope that RideOnTrack can play an important role in this technological development.